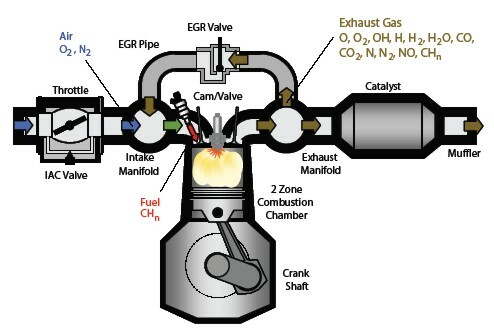 Enginuity enables engine strategy development within the Mathworks simulation environment, significantly reducing the dependence on expensive experimental testing. The underlying engine model has been designed to be real-time capable and emulates the engine dynamics with sufficient accuracy over the entire engine operating envelope. The model supports control strategy development at any level of complexity, either for exploratory purposes or for production intent systems. Rapidly assemble models for any target engine configuration. Prebuilt 4, 6, and 8-cylinder models included. 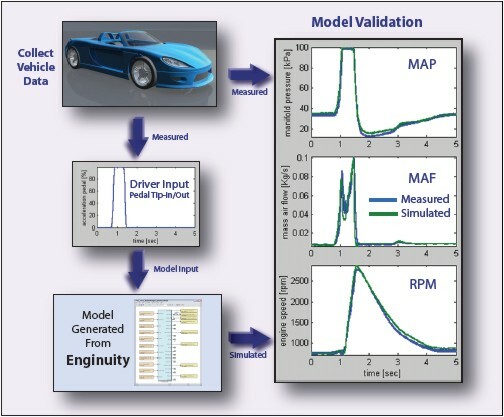 Rapidly tune a model to match any engine. Create libraries of engine models. Avoid months of model tuning for each engine type. Assemble any engine model from the engine component library. Determine geometric and material constants and enter using the parameter editor. Collect static engine mapping data and convert to Matlab format. Use this data to tune the engine model using the automated tuning tool. You now have an accurate model of your engine in native Simulink. Use this model to design and test any engine control system in simulation. Optionally, use the add on tool, LTI++, to generate a linear minimum order model of your engine. Then use this tool to assist with the design of your control system.